I am officially chastened and humbled. I never read comic books as a child, or a teen, or a college student. The first comic book I read was The Blue Beetle, and that was only because it was set in my hometown of El Paso. Therefore, the sage of Ant-Man pretty much escaped my notice. When I heard that Marvel was going to make a movie about this miniscule hero of the Marvel Universe, my reaction was laughter. Now, having seen the movie, I realize that I should not make a snap judgment about a film merely because I find the premise an oddball one. Ant-Man is the best Marvel film this year (sorry, Age of Ultron). Ant-Man, for me, was everything the bloated, overblown, self-important Age of Ultron was not: a story that works independent of the Marvel Cinematic Universe that can also compliment that whole universe, fun, funny, balancing the humor with action, believable visual effects, strong action pieces, believable and likable characters, and more important, a strong sense of logic. Honest to goodness logic. Or at least enough logic to rationalize the idea of a man shrinking to the size of an ant. Scott Lang (Paul Rudd) is a recently-released robber (or burglar, since robbery involves threats, which he didn't in his crime) who is trying to go straight. Not an easy task given his criminal record. He also has the added difficulty of a forced separation from his daughter, Cassie (Abby Ryder Fortson), whom he loves. There's no love between Scott and his ex-wife's fiancée, Paxton (Bobby Cannavale). Scott cannot afford child support, which is his only flaw as a father (since both father and daughter truly love each other). Scott is talked into a heist by his bumbling buddy Luis (Michael Pena), who tells him via a long chain of people of a vault of a rich old guy who is on vacation the whole week. Scott uses his athleticism and intellect to break into the vault, but is astonished to find nothing more than what looks like an old motorcycle suit. He takes it anyway, and secretly tries it on. To Scott's total shock, he not only hears a voice but is shrunk to the size of an ant, making a desperate run for his life. He finds that he has been monitored by Hank Pym (Michael Douglas), who not only designed the suit but also allowed the break-in to test Scott's skills. Hank offers him a chance to train to stop Pym's former protege, Darren Cross (Corey Stoll), from discovering this technology that Cross will use to weaponize. Aiding Pym is his bitter daughter, Hope (Evangeline Lilly), who thinks she can do it himself. Cross has been working furiously to crack Pym's formula, and is slowly going mad in his efforts. With him now on the cusp of having a breakthrough, it will take the concerted efforts of Pym, Hope, Scott, and Scott's criminal crew of Luis, Dave (Tip "T.I." Harris) and Kurt (David Datsmalchian) to stop Cross, now as Yellowjacket, able to shrink himself, from wreaking havoc. Just how much better was Ant-Man to Age of Ultron? It at least had the decency to have mid and post-credit scenes, which Age of Ultron didn't. I got burned in more ways than one at Age of Ultron's failure to close with a scene, so much so that I walked out of Ant-Man pretty soon as the closing credit's began. Hence, I had to read about the two scenes online. To me at least, this shows that Ant-Man welcomes me into the Marvel Cinematic Universe instead of leaving me out of things. Another positive aspect to Ant-Man are the performances. Paul Rudd doesn't automatically come up when thinking of 'action' star, but the odd thing about Rudd is that while he's best known for being the quick-witted comic lead he has always been capable of being a more serious actor. His Scott Lang balances being fully aware of the oddity of it all with a desire to protect his daughter (leading to one of the film's best action scenes taking place in her bedroom). Lilly I think was appropriate icy as Hope, and I think Ant-Man did an interesting job in counterpointing Lang's desire to be with his daughter to Pym's desire to be his own daughter. Douglas never plays down being part of this universe, but plays it seriously. In fact, the fact that just about everyone plays it seriously is what elevates Ant-Man to a higher level. Again, thinking on Age of Ultron, Hawkeye made mention that a lot of the situations the characters are in is a bit ludicrous. In Ant-Man, all this is played as if this is real, which is what makes it more successful. Curiously, the only one who doesn't play it straight is Pena, but that is a plus. His Luis is a delight with his upbeat, dim personality. I can't say I related to his endearing but slightly dimwitted criminal (the San Quentin version of Rose Nylund), but I do know people who speak exactly like Luis do (going into long explanations to how the came upon information by linking every link in sometimes excessive detail, complete with the vocal inflections). In another world, Pena would be mentioned in Best Supporting Actor talk for his humorous turn in Ant-Man. It's doubtful, but Pena really came into his own and one hopes that this cholo with a heart but not much of a brain makes a return appearance in another Marvel film. The visual effects are so well-done that the incredible idea of two tiny figures in costumes fighting it out on a Thomas the Tank train set becomes exciting rather than laughable. The tie-ins with the overall Marvel universe with Anthony Mackie's Falcon at least weren't forced but flowed into the story and worked. In short, Ant-Man could be a film independent on its own and as part of the overall Marvel Cinematic Universe, which makes it a rare film that doesn't play like either a trailer or a sequel. About the only things I really didn't think greatly on were Christophe Beck's score and maybe Stoll's mad scientist Darren Cross. He did just pop in and out and oddly didn't play a large part in all this. I can't say it was terrible, but I wasn't overwhelmed. 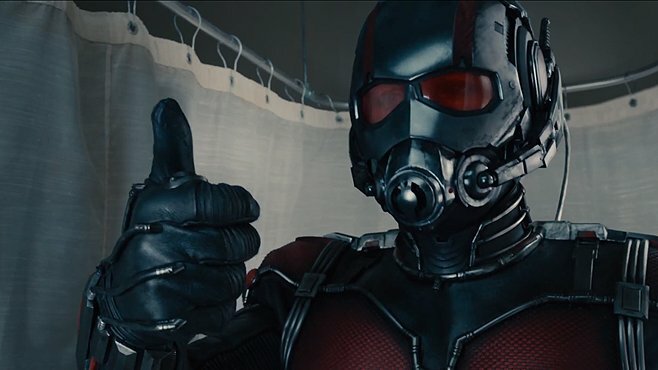 As it stands, Ant-Man was fun, funny, action-oriented, and a good time. I was surprised that the whole thing worked and held up remarkably well. On the whole, Ant-Man is really a fantastic film that works on nearly every level. Ant-Man may be small, but it is mighty. Glad to see that you enjoyed Ant-Man as well! Honestly, I did not expect it to be so much fun. I almost expected it to have a goofier tone, but it really did deliver the thrills and laughs. I can't wait to see more of the character in the upcoming sequel. Great review Rick! I was surprised too at how good Ant-Man was too. I'm glad that things worked well and I hope the sequel will keep the high standards of the first. Good review! I'm glad you liked it in spite of you prejudgment. It's always nice when movies impress you even when you're not ready to be impressed. :D I definitely agree that this was the best Marvel movie of the year. I like what you said about Paul Rudd being able to pull off the hero. I definitely think he was perfect for the part. 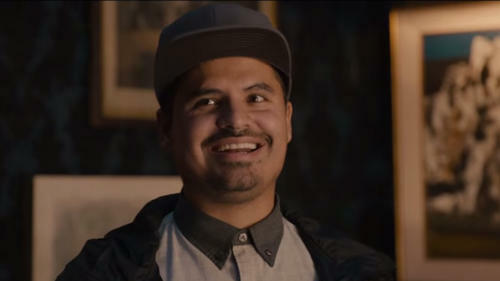 And Michael Pena was just brilliant! I agree about the villain too. I like Stoll a lot, and he probably did the best he could with what he had, but the character ended up being less than great. Thanks. Rudd has always been capable of so much more than what many of his movies have shown, and Pena is a hoot. I'm glad both of them have had this moment to shine.